Wells Fargo is reportedly the main bank for the National Rifle Association and the largest financier of the gun industry, having loaned the industry hundreds of millions of dollars. "It's time to practice what we preach. I am a 35-year customer of San Francisco's Wells Fargo bank. I've liked that my bank is based here in my home city. However, I was dismayed to read in the New York Times last month that 'Wells Fargo is the largest financier in the nation of the gun industry and is the main bank for the National Rifle Association.' Further research reveals that Wells Fargo has lent more than $400 million to the gun industry in the past five years -- since the slaughter of schoolchildren at Sandy Hook Elementary School -- and has remained unapologetic about such practices. I have attempted to remain a loyal customer despite the Wells Fargo's scandals of recent years, pending the new leadership's efforts to confront those. But as a public health professional and medical ethicist, I cannot overlook this link to an industry partly responsible for the ongoing gun violence in our nation. Gun violence is a public health and medical epidemic that cannot be supported, and 'thoughts and prayers' aren't nearly enough. Thus I wish to announce publicly my intent to divest all my resources from Wells Fargo, and to urge others to do likewise. Beyond talking to your own adviser and banker, there are resources online to help do this; goodbyegunstocks.com is just one." 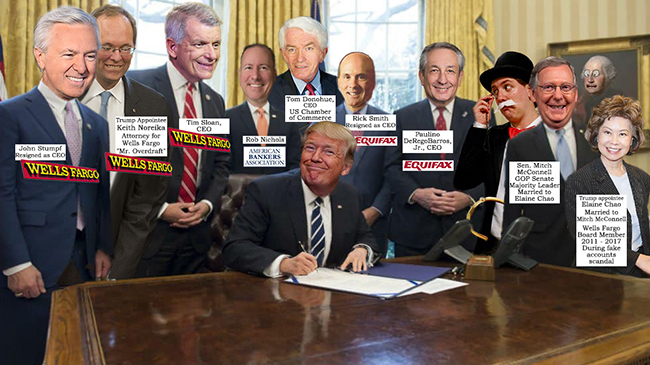 Trump signs Act to take away Americans' Constitutional right to fight back in court against crooked banks that violate the law and steal from their customers. This anti-consumer Act was opposed by over 370 groups that represent consumers, seniors, workers, and our nation's military Servicemembers and veterans. Republican Senate Majority Leader Mitch McConnell made taking away consumers' rights a huge priority. His wife Elaine Chao served on the Board of Directors of Wells Fargo while the bank engaged in many illegal activities, including creating fake bank accounts, charging for unwanted auto insurance policies, and ripping off military personnel serving in war zones. If Wells Fargo were your boyfriend... you'd break up with your boyfriend. Senator Elizabeth Warren (D-MA) quotes from the Military Coalition's letter in support of saving the CFPB's rule, which would grant our military heroes the Constitutional rights they fight and sacrifice to preserve, for our entire nation. Trump recently signed legislation that was opposed by Military, Veterans, and consumer organizations, allowing Wells Fargo and other banks that engage in massive fraud to get away with cheating millions of customers, by imposing forced arbitration on them through "ripoff clauses" that are often hidden in the fine print. 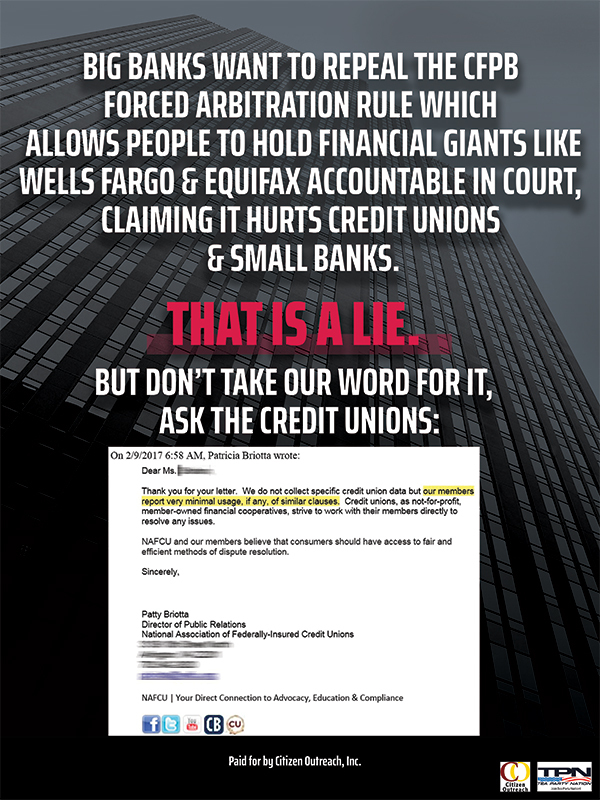 According to Pulitzer-Prize winning journalist Michael Hiltzik, of the Los Angeles Times, "Here's why Wells Fargo forces its customers into arbitration: It wins most of the time." 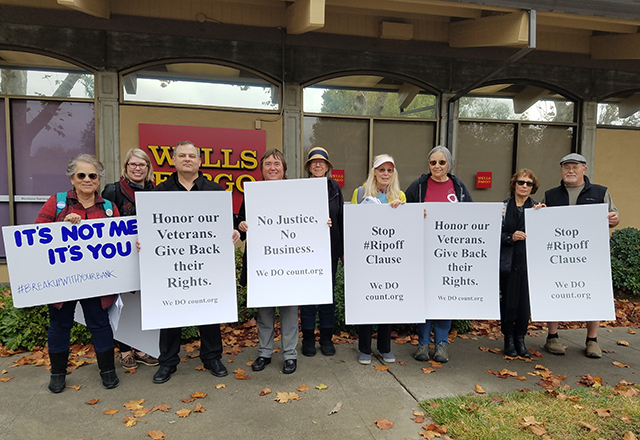 A couple days before Veteran's Day, military Veterans, relatives of Veterans, and supporters in Davis, CA protest against Wells Fargo. Bank managers called the police, who declined to arrest the peaceful protesters. 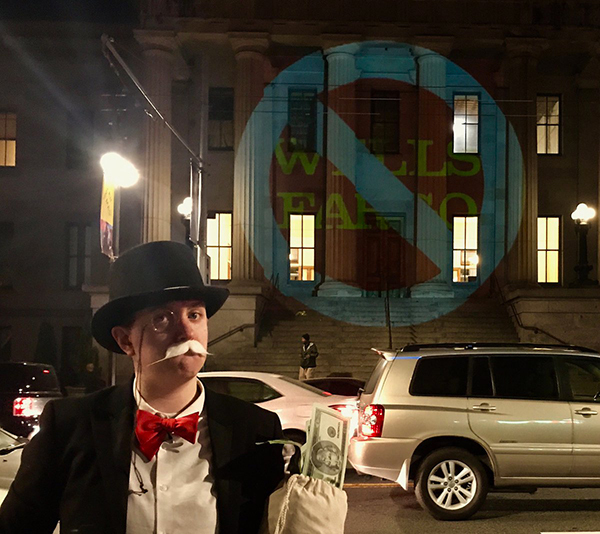 The protesters urged people and businesses with accounts at Wells Fargo to switch to credit unions, where typically there is no forced arbitration clause. Sacramento consumer Megan Varvais closed her accounts with Wells Fargo. 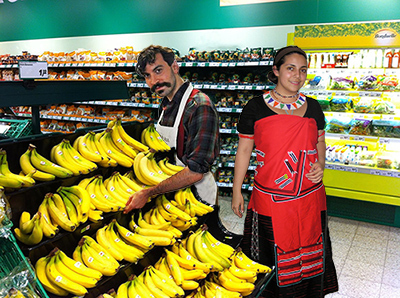 She recently opened up new accounts at Golden One. 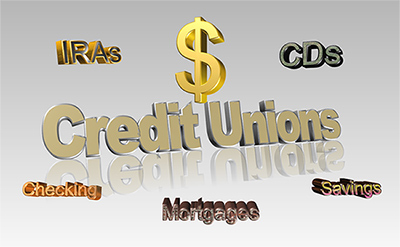 CARS released the results of new research into the 131 California-chartered credit unions, which found that most credit unions in California do not take away their customer's rights to sue or to join a class action. Wall Street and Wells Fargo made it a top priority to kill a rule issued by the Consumer Financial Protection Bureau that would have restored consumers' freedom to choose whether to band together and take banks that rip them off to court, or to pursue claims in private, corporate-controlled arbitration, a rigged system that consumers extremely rarely even attempt to use. 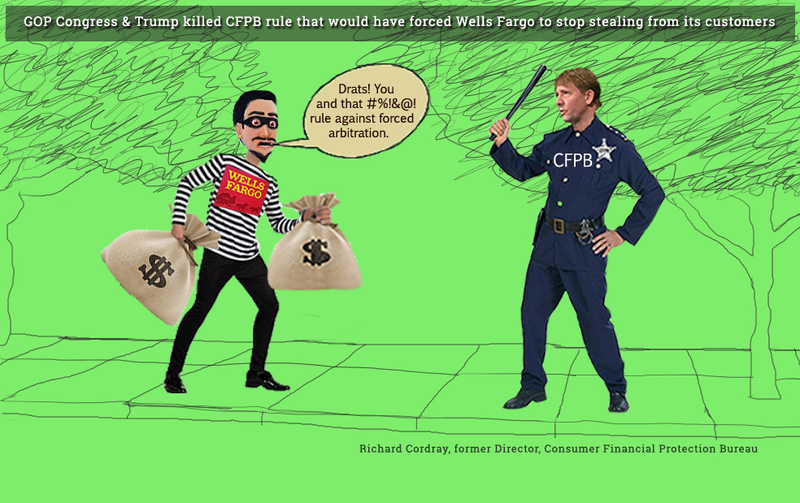 Wells Fargo and other Wall Street banks are currently celebrating a huge victory against being held accountable by their victims, thanks to GOP Members of Congress, who voted in the dark of night, and President Trump, who signed the anti-consumer, anti-military legislation into law behind closed doors, killing the CFPB rule. Congressman Garamendi and all other Democratic members of Congress voted to save the rule and consumers' Constitutional rights. Among Wells Fargo's victims: active duty military Servicemembers, whose vehicles Wells Fargo illegally repossessed, even when they had set up automatic payments before deploying to war zones. When military servicemembers experience financial readiness problems that harm their credit, such as vehicle repossessions, they may lose their security clearances, which can harm or even end their military careers. The loss of security clearances can pose a serious threat to our national security, as our nation desperately needs Servicemembers to be able to serve in the capacities they trained for, including in military intelligence, which requires high level security clearances. 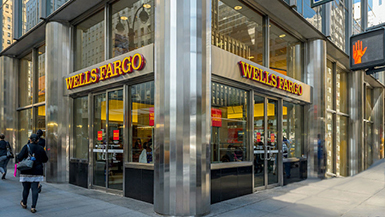 A coalition of 29 military and veterans groups opposed the effort by Wells Fargo and other big Wells Street banks to overturn the consumer-friendly rule. 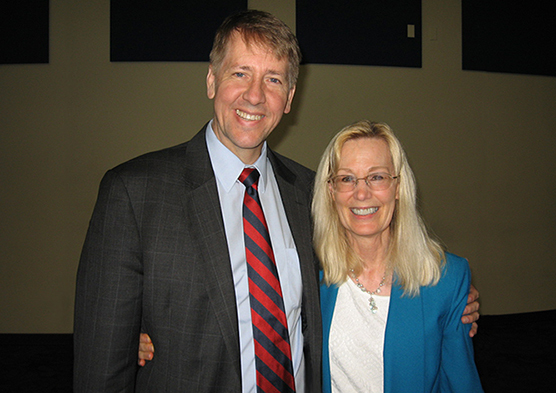 The Military Coalition, which represents 5.5 million current and former servicemembers and their families, supported the Consumer Financial Protection Bureau's rule to free consumers to choose whether to take banks to court or to use private arbitration, calling forced arbitration an "un-American system wherein servicemembers are funneled into a rigged, secretive system." The Consumer Financial Protection Bureau studied 419 class actions and found $2.7 billion in relief over five years for consumers, with just 18 percent going to attorney's fees and expenses. That is, $2.2 billion, or 82 percent, went to consumers — a far cry from a penny. When banks cheat millions of people out of $100 each, it takes lawyers on consumers' side to fight back and, yes, they get paid more than $100 if they win — but only if they win. "It's shameful that our nation's Commander in Chief sided with Wall Street, and failed to honor the military community's veto request. Now it's our mission to show our military heroes and veterans that we have their backs, even if he doesn't," said Rosemary Shahan, President of the non-profit consumer advocacy organization Consumers for Auto Reliability and Safety, based in Sacramento. Shahan was married to a Navy Judge Advocate General officer for 20 years, and is the daughter and niece of veterans of World War II. "I'm breaking up with Wells Fargo because President Trump took away our right to fight back in court if we are ripped off, and now it's up to all of us to protect ourselves by not doing business with dishonest banks. I refuse to do business with a bank that has a ripoff clause and imposes forced arbitration," said Sacramento consumer Megan Varvais. "It's also important to me to support our Military Servicemembers and Veterans, who deserve to have the freedom to choose to take a bank that ripped them off to court." Varvais successfully sued JP Morgan Chase as a leading member of a class action that forced Chase to refund over $110 million in illegal overdraft fees to its customers, most of them struggling low-income consumers and their families. Chase also was compelled to reform its practices, benefiting future customers. Photo of Steve in uniform, circa 1986. "I was proud to wear my country's uniform and serve in the United States Marine Corps. Today I'm also proud of our military and veterans associations, which have been standing up for our nation's Servicemembers and their families, and veterans, against crooked banks like Wells Fargo, to preserve our freedoms and fundamental Constitutional rights. It's shameful that our nation's Commander in Chief failed to honor the military community's veto request. Now it's up to us to send crooked banks a message: This fight isn't over. They won that battle, but we the people will win the war," said Steve Baumann of Woodland, CA, a Veteran who served in the U.S. Marines from 1986-1990. "My wife is a veteran, and I couldn't be more proud of her and her service. Today we're sending a clear message that we're not going to let Wells Fargo and other crooked banks keep ripping off consumers, including our military heroes and veterans. 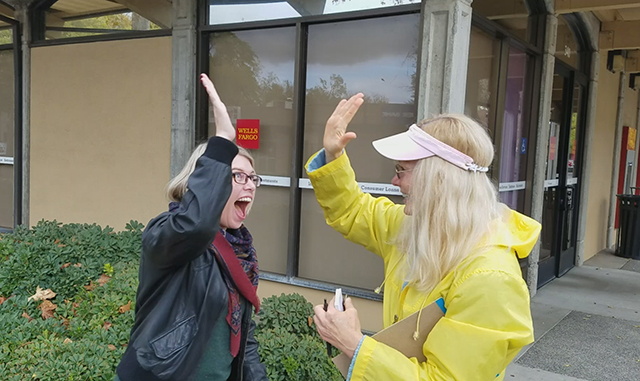 Wall Street may have won in Congress, but we're going to win in the end," said Linda Deos, a consumer attorney and Davis resident who specializes in representing consumers in bankruptcy cases. While some GOP Members of Congress have claimed that somehow forced arbitration is "better for consumers," those claims ring hollow, particularly since many of them voted to grant auto dealers a special exemption from the Federal Arbitration Act, restoring their right to sue auto manufacturers or anyone else they choose, in a court of law. "When mandatory binding arbitration is forced upon a party, for example when it is placed in a boiler-plate agreement, it deprives the weaker party the opportunity to elect another forum. As a proponent of arbitration I believe it is critical to ensure that the selection of arbitration is voluntary and fair. 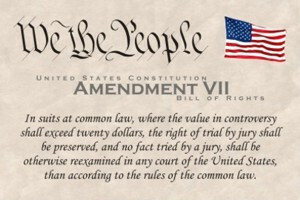 The purpose of arbitration is to reduce costly, time-consuming litigation, not to force a party to an adhesion contract to waive access to judicial or administrative forums for the pursuit of rights under State law…. 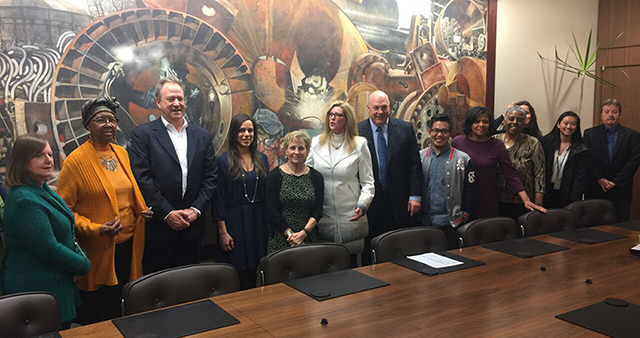 This legislation will go a long way toward ensuring that parties [car dealers] will not be forced into binding arbitration and thereby lose important statutory rights. I am confident that given its many advantages arbitration will often be elected. 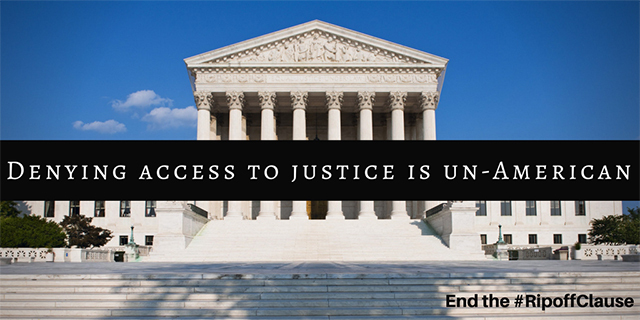 But it is essential for public policy reasons and basic fairness that both parties to this type of contract have the freedom to make their own decisions [whether to sue or not] based on the circumstances of the case." -- Senator Chuck Grassley, (R-Iowa) Source: Statements on Introduced Bills and Joint Resolutions, United States Senate, June 29, 2001. 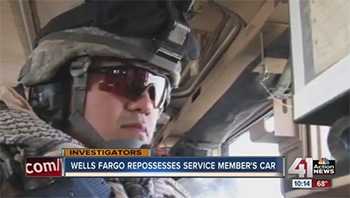 "Wells Fargo accused of unlawfully repossessing Service member's car while deployed"
KANSAS CITY, Mo. -- It's been six years since Army Sgt. Jin Nakamura was serving in a combat zone in Iraq. After Sergeant Nakamura sued, Wells Fargo admitted that it had not even bothered to check the federal database to find out whether its customers were in the military and serving on active duty, before illegally seizing their cars, without any notice. While fighting for his country, Nakamura learned he was about to be taking on a whole new battle back home. "I was checking my credit history and saw that my car, I thought I was making payments to, was [repossessed]," Nakamura said. "I thought there was a mistake." When Nakamura discovered the issue on his credit report, he said he contacted his lender, Wells Fargo, immediately. "I tried to make the payment so I could have my car back when I got home," Nakamura said. "But, I found out they [Wells Fargo] auctioned my car a few days before." Prior to deployment, Nakamura said he set up direct payments for his auto loan through Wells Fargo. According to Nakamura, he was not given any warnings or notice that the payments were not going through. Note: Sergeant Nakamura's contract with Wells Fargo -- from over 6 years ago -- did not include a "rip-off clause," so he remains free to sue Wells Fargo on behalf of himself and other military Servicemembers. But now Wells Fargo includes forced arbitration in all of its customer contracts, denying military Servicemembers the basic, fundamental Constitutional rights they fight to preserve, for all of us. Unlike a court of law, arbitration operates in secret and it's usually impossible to get discovery of telltale documents, like the ones that showed that Wells Fargo failed to even check the federal military database, as required by law, before seizing military Servicemembers' vehicles and auctioning them off. 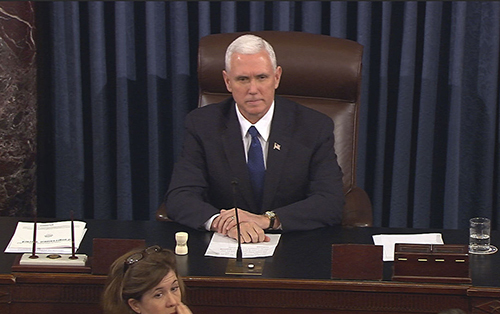 These illegal practices are a threat to our national security. 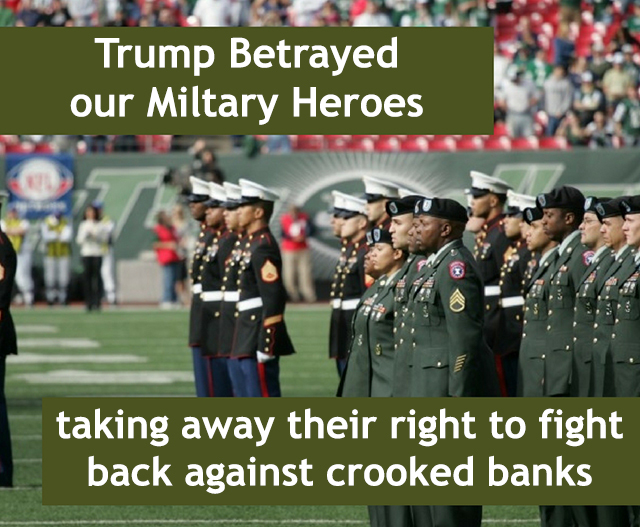 We ALL have a stake in ensuring that our military heroes and their families are not preyed upon by crooked banks. When military Servicemembers are ripped off, and have financial readiness issues, they can lose their security clearances. When that happens, it not only harms them and their families, it also often means that we as a nation lose the benefit of their services, in extremely important and demanding capacities, where we desperately need them to do the jobs for which they were trained. KSHB-TV Kansas City: "Wells Fargo accused of unlawfully repossessing Service member's car while deployed"
"By a single vote, Republicans throw out years of work on consumer protection"
"The repeal of the CFPB's arbitration rule reeked of the banking industry's heavy-handed influence over Washington's politicians," said Christine Hines, legislative director for the National Assn. of Consumer Advocates. "Wall Street's power, including its tens of millions in donations to campaign coffers, made it easy for Senate Republicans to choose big banks and predatory lenders over the rights of their own constituents," she said. What's particularly repulsive here is the shamelessness with which conservatives framed the debate — pretending they were saving consumers from rapacious trial lawyers rather than doing the bidding of deep-pocketed corporate backers. They also repeatedly painted the CFPB as a "rogue agency" that was unaccountable to the American people. Before President Trump took office, the 21-year-old law was used only once, during the early days of President George W. Bush's administration. Prior to this week's Senate vote, the Treasury Department took the remarkable step of issuing a report criticizing the arbitration rule as being anti-consumer. The Treasury report was released Monday. Yet by a miraculous bending of the time-space continuum, it was cited a day earlier in a Wall Street Journal editorial concluding that the bureau's rule was "arbitrary and capricious," and that it "benefits no one but the lawyers who donate to Democrats." Here's the thing: At least class actions provide something for plaintiffs. Arbitration often provides bupkis, which is probably why businesses are so enamored of it. They're also one of the most effective ways of holding companies accountable for bad deeds. 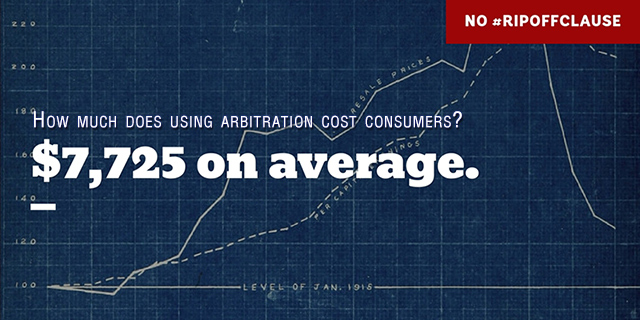 A $100 arbitration payment won't cause much of a ripple. a $100-million class-action settlement will make an impression. As soon as Trump signs off on Congress' repeal bill, the Republican Party will have ensured that businesses maintain the upper hand in any dispute. Screwed / adjective / skroōd: in a difficult or hopeless situation; ruined or broken. Los Angeles Times: "By a single vote, Republicans throw out years of work on consumer protection"
"5 things Wells Fargo Bank account victims should do"
"If you've been a loyal Wells Fargo customer for decades, maybe you're ready for a fresh start. Smaller banks and credit unions are less likely to force dissatisfied customers to use arbitration to resolve problems. Leaving your big bank may also lower the amount of fees you pay and give you higher yields on CDs and savings accounts. 'You're probably better off just going to a credit union or a community bank in your area where it would be unusual for you to encounter the kinds of monthly maintenance fees that the giant banks commonly charge,' Ridout says. 'And you probably would get a lot more from your savings.' "
Read more: "5 things Wells Fargo account victims should do"
"Wells Fargo Customer: It felt like my car was held as extortion"
"Imagine keeping up with your Wells Fargo car loan payment every month -- but having your vehicle repossessed anyway. That's exactly what Samir Hanef said happened to him. 'My car was held as extortion and I was forced to pay for Wells Fargo's mistake,' Hanef told CNNMoney. 'The stress and anxiety ... are truly indescribable,' said the clinical social worker from Durham, North Carolina. 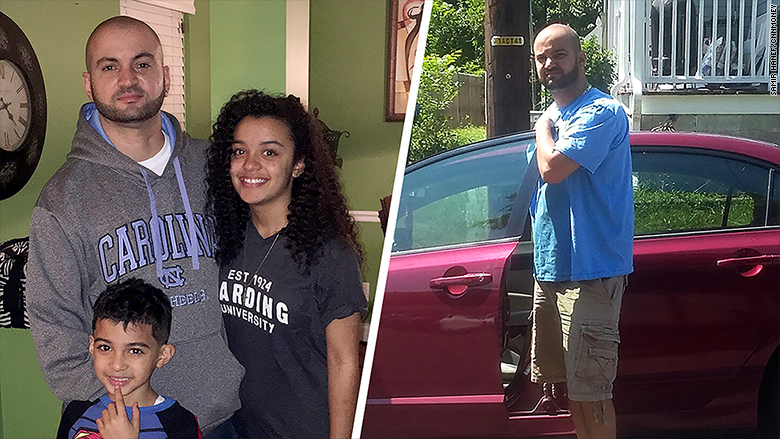 Samir Hanef's family and his Honda Civic. 'They told me the car would be sold on auction if I didn't pay the ransom,' Hanef said." 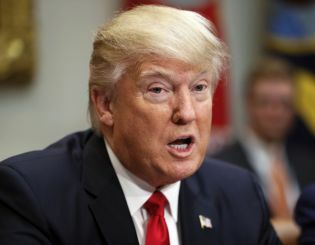 CNN report: "Wells Fargo Customer: It felt like my car was held as extortion"
"On people's right to sue, Trump's hypocrisy matches that of business"
"Donald Trump has been party to nearly 4,100 lawsuits over the last three decades. About half the time he was the one doing the suing; the other half he was the one being sued. However, Trump clearly has no interest in a level playing field...."
Read more: LA Times Column: On people's right to sue, Trump's hypocrisy matches that of businesses. "The scandals and accusations continue to mount for Wells Fargo. This time, the banking giant is being accused of overcharging small businesses to process credit card transactions. In a potential class action filed earlier this month in a New York federal court, a restaurant owner from Pennsylvania and a North Carolina tour company allege that Wells Fargo's Merchant Business Services operates an "overbilling scheme" that charged excessive and undisclosed credit card processing fees, along with 'massive early termination fees' the merchants tried to end their relationships with the bank. In the case of Pennsylvania-based Patti's Pitas, the restaurant claims that Wells Fargo charged it with 'exponentially more fees' that were not outlined in the fee schedule or program guide. These fees, the suit notes, often totaled hundred of dollars each month." The Consumerist: "Wells Fargo accused of overcharging small businesses"